Will Steve McQueen be first black film-maker to win best director Oscar? Gong for 12 Years a Slave nominee would follow year of real progress, but history shows such breakthroughs are illusive, Andrew Pulver writes in this article for London’s Guardian. 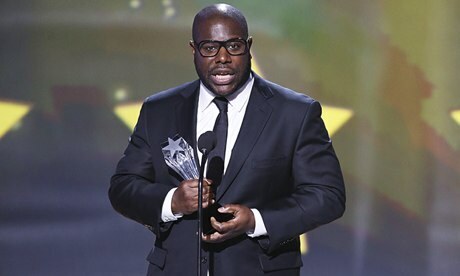 Steve McQueen may not be the favourite to win the Oscar for best director when the statuettes are handed out on 2 March, but if he does it will represent a historic breakthrough for black film-makers: none has ever been honoured in this category and only two others have even been nominated – John Singleton in 1992 for Boyz n the Hood and Lee Daniels in 2009 for Precious. The claims of Alfonso Cuarón, director of space-walk thriller notwithstanding, we may witness a moment equal to that of Kathryn Bigelow’s, when in 2009 she became the first woman to win the best director Oscar for The Hurt Locker (defeating Daniels as she did so). McQueen’s prominence arrives on the back of a year that saw real progress for black film-makers, particularly in the US. Fruitvale Station, a low-budget film about the real-life killing of a black teenager by transit police in Oakland, California, took the big prize at the 2013 Sundance film festival. Sober stories – such as McQueen’s 12 Years a Slave, the Jackie Robinson biopic 42 and The Butler – investigating the African American role in US history have done well with critics (though The Butler, despite early buzz, was shut out of theOscars). Commercial success has greeted other less artistically distinguished films, such as The Best Man Holiday and A Madea Christmas – the latter written, directed and starring one-man powerhouse Tyler Perry. However, watershed periods for African American film-makers have happened before. The blaxploitation fad of the 70s created opportunities for directors such as Melvin van Peebles (Sweet Sweetback’s Baadasssss Song and Shaft).The early 90s saw the rise of “new jack” cinema, such as Boyz n the Hood, Mario van Peebles’s New Jack City, as well as Spike Lee’s Malcolm X. In the 2000s, Keenen Ivory Wayans scored a string of successes at the box office with the Scary Movie horror-parody series. Will Smith became a bona fide global film star in the mid-90s – though, significantly, he has never had an African American director. Breakthroughs have often proved illusory. In 2011, African American directors were reported to comprise only 4% of the Directors Guild of America’s 15,000 film-makers. The highest-grossing black director of all time is Perry, with a lifetime box-office gross of $726m (£444m) in the US. In second place is the perhaps less well-known figure of Tim Story, who can thank two Fantastic Four pictures for his $490m. This compares to $4.1bn lifetime gross for Steven Spielberg, the all time number one, and $2bn for Robert Zemeckis, who is in second. The position of black female directors is considerably worse, with Angela Robinson, director of Herbie: Fully Loaded occupying the highest-grossing position. Despite the likes of Julie Dash (Daughters of the Dust) and British director Amma Asante (Belle), critical acclaim has also been hard to find. The situation of black directors is in stark contrast to that of actors; in some ways it is analogous to that of black football players and club managers. Hattie McDaniel was the first black actor to win an Oscar (best supporting actress in 1939 for Gone with the Wind) – but in many ways that was an aberration, as roles were largely confined to victim/servant stereotypes until the 1960s. Pinky, a 1949 race drama about a light-skinned black woman passing for white, was another exception, garnering a best supporting nomination for Ethel Waters. Sidney Poitier blazed a trail in the 60s for Lilies of the Field, winning best actor for his role as a handyman helping a group of nuns build a chapel in the desert. 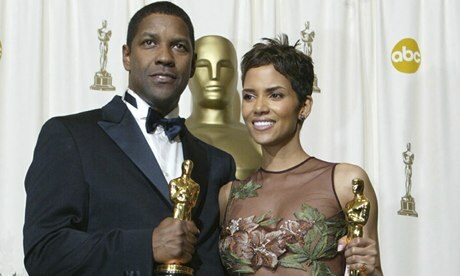 However, after a string of nominations, the second African American actor to take that honour was Denzel Washington in 2001 forTraining Day – in the same year that Halle Berry became the first black woman to win best actress, for Monster’s Ball. In recent years, there would appear to be little obvious impediment to black actors’ success, with the likes of Viola Davis, Quvenzhané Wallis, Morgan Freeman and Forest Whitaker among those being nominated – and in some cases winning – Oscars in the past 10 years. But if there is still a barrier to directors, in other behind the scenes roles the situation is even worse. Only one black cinematographer, Remi Adefarasin, has been nominated (for Elizabeth), and one editor, Hugh A Robertson (Midnight Cowboy). There has been one black winner of a screenplay Oscar (Geoffrey Fletcher for Precious), though 12 Years a Slave‘s John Ridley is a good bet to join him. No black producer has ever won best picture. Predictably perhaps, black artists have been most successful in the best original song category, with Isaac Hayes, Stevie Wonder and Irene Cara among the five winners. So all eyes will be on McQueen to see if he can see off his rivals on 2 March – but history may have to wait.